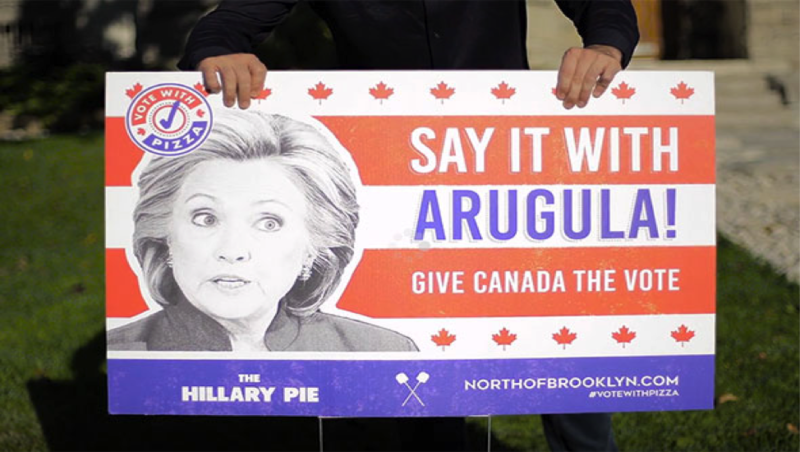 Canadians are deeply interested in the US Presidential campaign, as they should be. The election will affect Canada-US trade, the future of NAFTA, immigration flows - and more generally, relations between the two countries. After watching the three debates and receiving daily coverage of the race, Canadians want a voice in the south-of-the-border election. 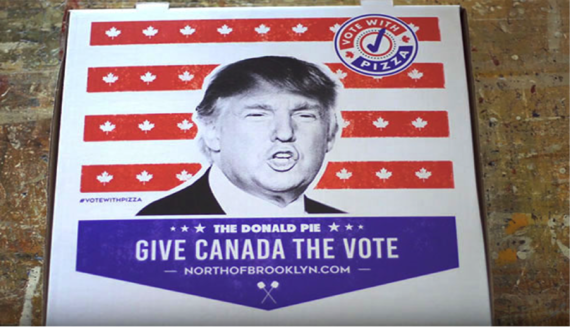 A Toronto pizza chain, North of Brooklyn Pizzeria, has taken the matter into its own hands (or ovens) and giving Canadians a chance to vote in the US election. 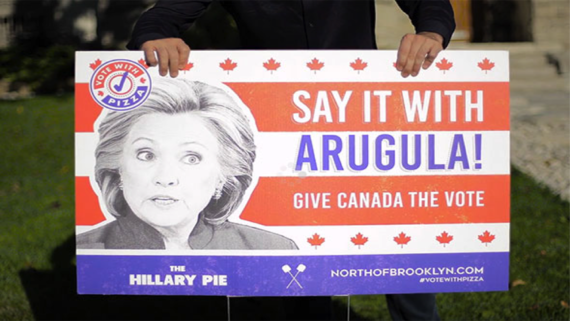 With the help of ad firm Engagement Labs, North of Brooklyn is promoting two presidential pizzas, for which Torontonians can cast their vote by purchasing one or the other. 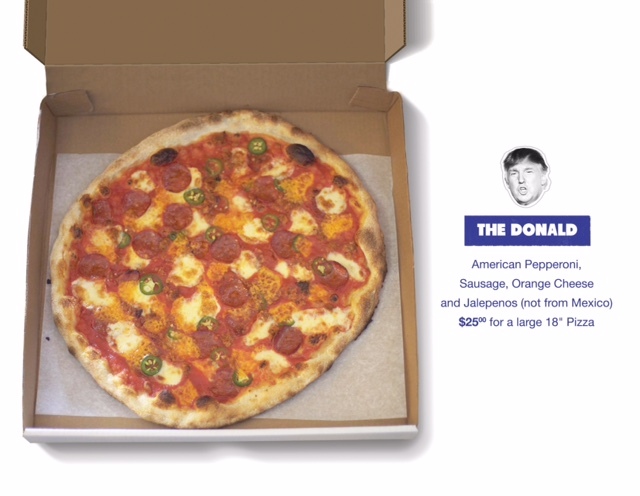 "The Donald" pizza is for meatheads, and features American pepperoni and sausage. "The pie is slathered in 'orange' cheddar cheese," says co-owner Josh Spatz, "to match Trump's head of hair." No Mexican jalapenos on this pie. 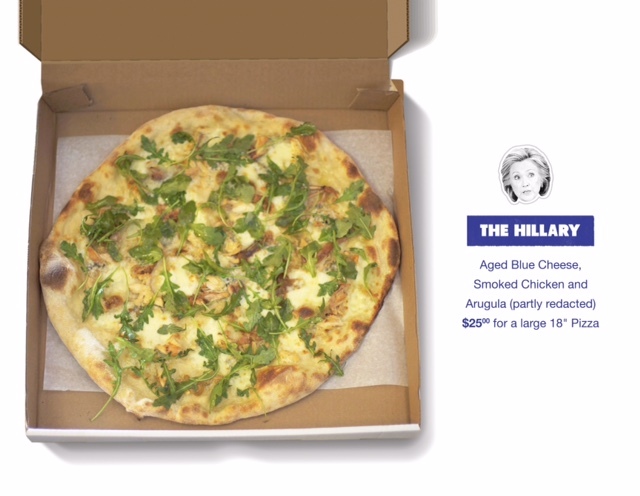 "The Hillary" is topped with blue cheese and bits of smoked chicken, "because some think she's a bit of a chicken" says Spatz, but the polls say she's "smok'in." "The highlight of her namesake pizza is 'partly redacted' arugula." Like the two political contenders, both pizzas are heavy on the dough, and served heated. Torontonians have until the upcoming election to make their choice and they are lining up to get into the act. 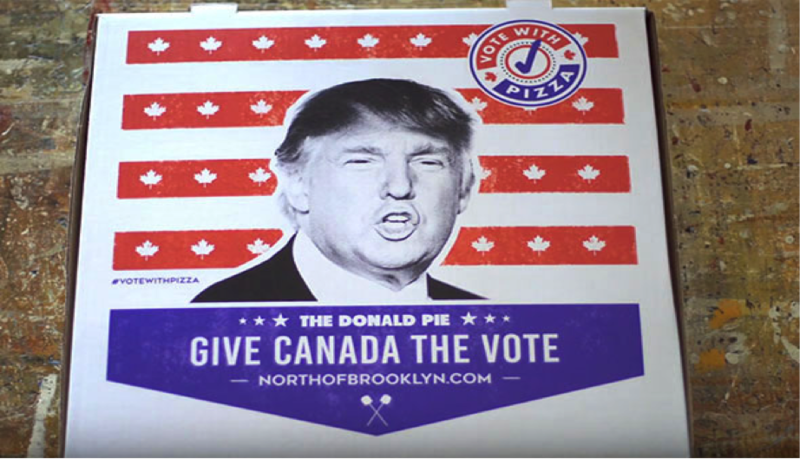 The crowning touch is that a dual American-Canadian citizen will vote in the American election for the candidate whose pizza sells the best. So Canadians will have a say in the next US election. Stay tuned, and enjoy the video.